Unfortunately it happens for Kyle and I this time every year. We fall off the healthy eating wagon and back into some of our bad eating habits. For those of you who don't know, Kyle and I have moved five times in the past four years and I know it shouldn't be an excuse or crutch for poor choices, but somehow it manages to creep up on us and every year after we move we look at each other and ask "what in the world have we been doing?!" This move has been particularly stressful because we knew we were only moving into temporary housing while we sold our home in Houston and looked for one in Dallas. I wish I could say I had it all together and weren't eating McDonald's because it was the easiest and fastest thing, but we did. Usually we continue in this pattern until the New Year #helloresoultions, but this year I am determined to get back into our healthy routine ASAP so I thought I would share with you my plan to get back into healthy habits! Look, you're human. You're going to make mistakes and that's okay! The most important thing is to realize it and make the necessary changes before the unhealthy decisions become deep rooted habits. Set yourself up for success by being realistic about your current health status (weight, age, injuries, activity level) and make a plan from there. This is your journey, so please don't compare your beginning to someone else's end! For some people, they need a structured change like the Whole30 or strict exercise program. I've written about the Whole30 numerous times here, here, and here for those of you who think you need something with no gray areas. For others you may need a more balanced lifestyle where you're allowed to enjoy things a little more leniently. Kyle and I are going to start with the latter choice because it makes the most sense for us and our current life situation. We plan on eating mostly paleo meals at home, but letting our hair down once or twice a week when we're out with family or friends. Once we are settled into our new house we plan on starting another round of Whole30 to really get back on track. It doesn't matter if you walk a mile a day or commit yourself to 6 workouts a week, movement is such a vital part of a healthy lifestyle. 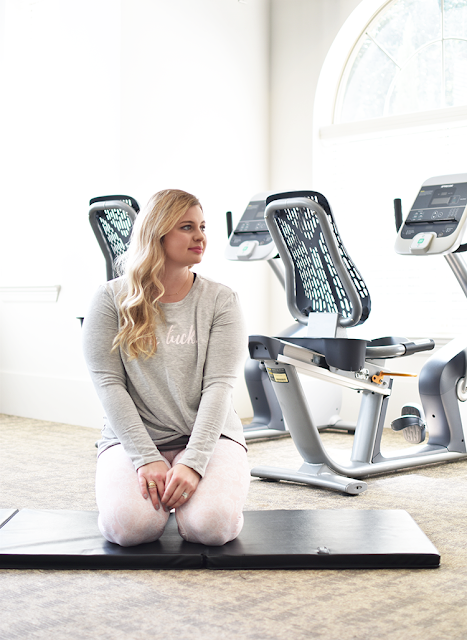 I personally like to take it slow when getting back into an exercise routine because if not, my body starts to let me know that I've pushed it too far. For me this means barre classes and using an elliptical most days of the week. Both are easier on the joints (hello, old sports injuries!) and to me are more sustainable than higher intensity workouts. However, if you're already involved in an exercise routine, you may ask yourself how you can differentiate your workout to challenge yourself a bit more. Are you a runner? Try getting yourself into a lower impact workout like yoga or barre. Or if yoga and barre are your thing, see if your studio offers a higher intensity class to try out! I see so many people set themselves up for failure because they say they want to lose x amount of weight in one month or they want to hit some insane fitness goal. I've totally been there, done that, and that's why I'm currently where I am. Important parts of goal setting are picking short and long term goals. Where do you realistically want to be in a month, 6 months, etc? Another thing to consider is setting measurable goals that have specifics. It's nice to say "my goal is to eat healthier" or "I want to start running" but honestly these are harder to attain because they have no measurable elements or a timeframe in which you want to achieve them. One of my goals is to be running outdoors by the time we are in our new house and I plan on getting there by starting with elliptical workouts and eventually mixing in treadmill workouts. I know I am not even close to being able to run in the Texas heat, so I need to let the seasons change and also get my body used to cardio again! Another goal is to do a Whole30 as soon as we are settled in our new home. In preparation for that I am planning on eating a mostly paleo lifestyle (80/20) to help get into healthy habits. Motivation is such a personal thing and I always love hearing what drives people to reach their goals. I'm personally motivated by the feeling of confidence in my own skin and when I look and feel great in my clothes (or a smaller size!). 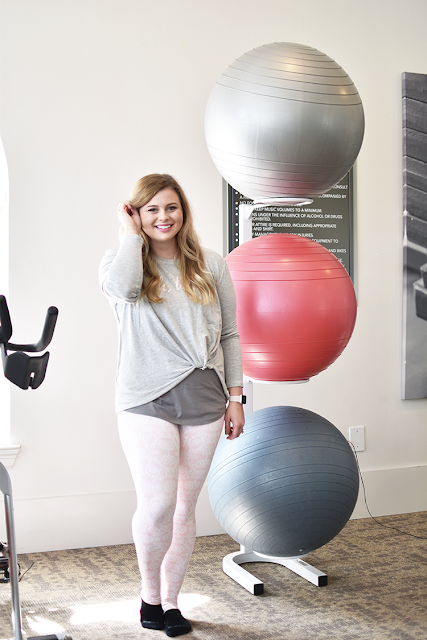 I looked at the leggings I'm wearing in this post forever and was honestly a little nervous to wear something that light on my lower half. I normally stick to black or darker colored leggings, but adored the light pink color of these. 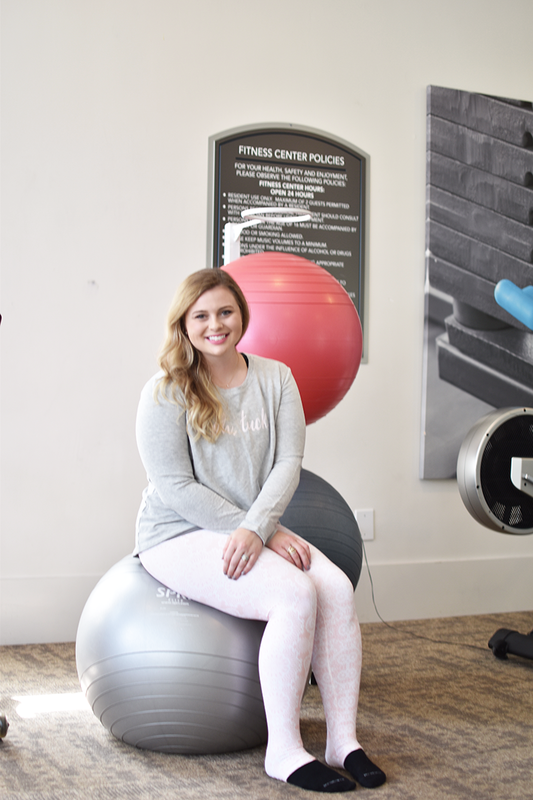 When Simply Workout reached out to partner with me on this post and I saw that they carried these on their website I decided to take the plunge and embrace the gorgeous pink color! I am so glad I did because not only do they fit wonderfully (high-waisted for the win), they also make me feel amazing and confident! I hope this post has inspired you on your healthy living journey. After writing this post I feel motivated to get back on track and am excited to share more about healthy living here with y'all!